New Law Review Article: "A Short Treatise on Amateurism and Antitrust Law"
It is with great excitement that I share the first draft of my newest law review article, "A Short Treatise on Amateurism and Antitrust Law: Why the NCAA's 'No Pay' Rules Violate Section One of the Sherman Act." This article is intended to serve as roadmap for challenging NCAA rules that prevent student-athlete pay. The article is currently under review by several law journals. Reader feedback is both encouraged and appreciated. Rick Reilly's column today, Selling Johnny Football, provides an interesting perspective on Johnny Manziel's trademark lawsuit filed in Texas against a man who was selling T-shirts that read, "Keep Calm and Johnny Football." It was reported that Texas A&M's compliance office recently received a ruling from the NCAA that an athlete can keep earnings (a damages award) obtained in a lawsuit. Why the NCAA thinks it must first give an athlete permission before he can sue someone for stealing his intangible property rights and keep the damages award if successful is beyond me. Would an athlete also need the NCAA's permission to sue someone for stealing his wallet or computer? But in any event, Reilly raises the point in his column that now that the NCAA has given its "blessing" for Manziel to enforce his legal rights against those profiting off his identity, he should go after the NCAA and Texas A&M now. Reilly asks: "How can the NCAA see the evil in some citizen cashing in unfairly on Manziel's name but not when it does it? How can Texas A&M send out more than 60 cease-and-desist letters to people selling Manziel items, as it says it has, and not accept one itself?" Last Thursday marked the five year anniversary of the thirteen commissioners of Miami-Dade County approving a plan to spend $347 million in taxpayer money to build a new 37,000 seat retractable-roof ballpark for the Miami Marlins -- a decision that I have previously criticized on Sports Law Blog here. In acknowledgement of this event, I wrote an article on Thursday for Forbes SportsMoney that posed the question of whether an empty Marlins Park will create backlash against sports stadium subsidies for other teams. The Marlins stadium deal is such an easy target because in no other case has the recipient of huge subsidies so brazenly turned around and slashed team payroll to lowest in the league. Furthermore, the Marlins stadium agreement only required the team to pay nearly a third of the building costs, while it awarded Marlins ownership 100% of stadium-related revenues -- not exactly what sounds like an equal partnership. On Sunday, Marlins owner Jeffrey Loria fired back -- taking out an advertisement in each of the major Miami newspapers -- defending both his ownership style and the Marlins Park deal itself. Presumably, Loria's response was based in part based on my Thursday article in Forbes. The ballpark issue has been repeatedly reported incorrectly and there are some very negative accusations being thrown around. It ain't true folks. Those who have attacked us are entitled to their own opinions, but not their own facts. The majority of public funding came from hotel taxes, the burden of which is incurred by tourists who are visiting our city, NOT the resident taxpayers. The Marlins organization also agreed to contribute $161.2 million toward the ballpark. Nevertheless, Loria's letter is easy to rebut -- even based exclusively on the facts in 'his' advertisement. For example, the fact that the ballpark was paid for with tourist taxes shouldn't matter because the tourist taxes could have just as easily been spent of public projects such as schools and hospitals, new public housing programs, or even as a way of maintaining the community's existing public works projects while lowering the community's overall tax base. 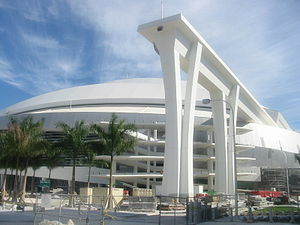 In addition, Loria's purported $161.2 million contributed toward the ballpark is not a mitigating factor because the ballpark deal allows Loria to keep all of the revenues from selling naming rights to the stadium -- a revenue stream that overnight reasonably could offset much, if not all, of the $161.2 million investment. Moreover, even if Loria does not sell these naming rights himself, the value of this right will clearly be factored into the Marlins ultimate sale price -- further increasing the Marlins owner's return on investment. I am not sure the purpose of Jeffrey Loria's recent advertisement, but I fully encourage continued dialogue on the topic. While I believe his arguments with respect to the stadium are without merit, I at least commend him for keeping the conversation about sports stadium subsidies firmly in the public eye. 1. Sports & the City: How to Curb Professional Sports Teams' Demands for Free Public Stadiums (Rutgers Journal of Law & Public Policy, 2008). 2. How to Curb Professional Sports' Bargaining Power vis-a-vis the American City (Virginia Sports & Entertainment Law Journal, 2003). 3. The House that Taxpayers Built: Exploring the Rise in Publicly Funded Baseball Stadiums from 1953 Through the Present (Villanova Sports & Ent. Law Journal, 2009). With due respect to the many great sport law and sports business conferences held each year -- and there are some excellent ones -- the best one is the MIT Sloan Sports Analytics Conference (March 1-2). I'm honored to be a panelist at this year's event; this is my fifth year in a row as a panelist and each year it gets better - a credit to the conference's organizers, Daryl Morey and Jessica Gelman. I'll be on the Beyond Reason: Sports Labor Negotiations panel on Saturday March 2. The conference is sold out, but at the following link you can register to watch many of the panels on-line. I always gain a ton of insight at this conference, which this year features as panelists Adam Silver, Michael Lewis, Mark Cuban, Stan Kaster, among many others, and has an awesome set of panels. If you aren't attending, the webcast is a must-watch if you're interested in our industry. New Sports Illustrated Column: When spectators flee a race crash, is video of it news or copyright protected sports event? Many spectators were hurt in yesterday's Daytona race because of a collision. A high school sophomore took a video of the crash and fans screaming and trying to get help. NASCAR wanted the video taken off YouTube, which for a while removed it but then put it back up. But only about 12 seconds of Anderson's 1 minute, 16 video is actually of a NASCAR race; the rest centers on the crash and fans scrambling for cover from flying debris. NASCAR's ownership over this latter part of the video is questionable, since "facts" and "news" are not subject to copyright protection and the First Amendment safeguards public access to them. The NBA knows this quite well. Back in 1997, the U.S. Court of Appeals for the Second Circuit ruled that the NBA could not claim copyright in its stats and scores, which Motorola had broadcast through a wireless paging device known as SportsTrax. The reasoning? Facts and news are not copyright protected. It could be argued that at about 13 seconds into Anderson's video, the race transformed from a copyright-protected NASCAR event into a not-copyright-protected news event. Fans screaming and fleeing for cover is not part of any race, but is certainly newsworthy. On the other hand, NASCAR might contend that because crashes are (unfortunately) not uncommon in NASCAR races, a crash should be considered a continuation of a copyright-protected NASCAR event. This is a difficult area of law and highlights how legal protection for "sports events" and "news events" may not always be the same. My longer treatment of the infield fly rule, The Economics of the Infield Fly Rule, is now available on SSRN and forthcoming in Utah Law Review. The abstract is below. Comments welcome. It is time to wake up. For decades the NCAA has created the illusion that their sole purpose was to defend the concept of amateurism within higher education. This trick has been sanctioned by none other than the Supreme Court when, in 1984, they recognized the NCAA as “the guardian of an important American tradition.…amateurism in intercollegiate athletics.” And, for far too long, the American public has accepted this deception; that those competing in college sports should remain amateurs, as defined by the NCAA, so as to delineate them from paid professional athletes. The argument is stale, the facts don’t support reality, and the public is recognizing the absurdity of the NCAA’s position: they insatiably embrace commercialism in all facets of intercollegiate athletics except on a single issue—athlete compensation. College athletics has evolved into an industry generating billions of dollars a year without paying the labor that produces the demand for this product. Perhaps one of the reasons public outcry has been muted is that the students engaged in these sports are, predominantly, minorities whose access to college the public often labels “an opportunity.” The popular argument, that scholarships offer free education to many athletes, is rebuffed by the systemic failure of schools and the NCAA to ensure that students competing in football and basketball graduate with their college degrees or even a valuable education.